London, England. 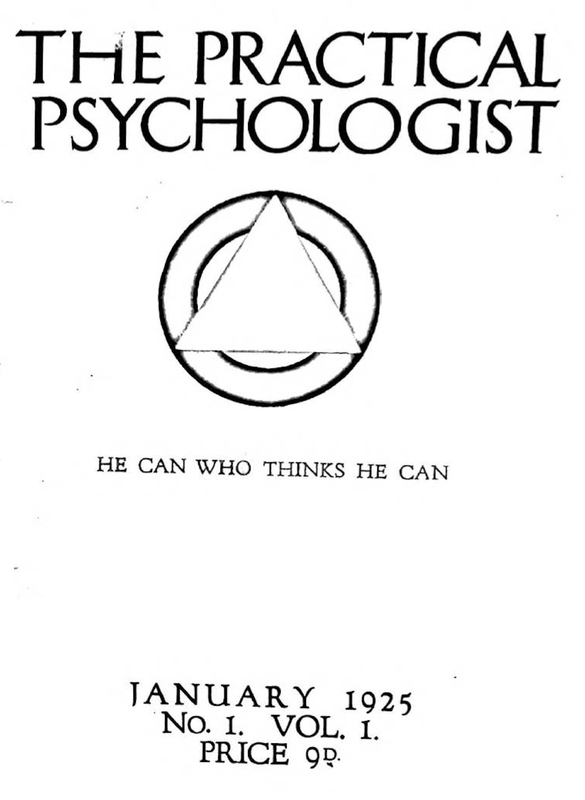 Publisher: Federation of Practical Psychology Clubs of Great Britain. Editor: Anna Maud Hallam, F.S. Hayburn. 1/1, January 1925-2/4, 1926. 44 pp., 9d an issue. This was the organ of the Practical Psychology Club of London and of the regional clubs united under the aegis of Hallam's Federation of Practical Psychology Clubs of Great Britain, founded after Hallam's arrival in Britain in 1922. She had started her practical psychology application of New Thought in Cleveland in 1921 and then moved to Britain, where she started clubs around the country. Her sister Alfaretta carried on the same work in New Zealand. Anna arrived on the crest of a wave of interest in the practical application of psychology, both in its "scientific" or "secular" and in its New Thought versions, to everyday problems. New Thought in the United States had earlier on begun to transform itself from the affective application of the mind to uplift, consolation and health, to a movement that widely taught the unfolding of man's inherent powers. All of this guised itself as "practical" but it was only with its absorption of the "suggestion" and "auto-suggestion" side of the revival of hypnotism/Mesmerism that New Thought began to advertise itself as the practical means of remedying daily problems and leading a more "efficient" life. See the note under William Abner Barnes's Practical Psychology (1900). In England A. Myddleton published his own Practical Psychology from Blackpool, beginning in 1924, and the same year Albert Osborne Eaves and George Bratley began to publish Applied Psychology, but it was Hallam who spread her clubs throughout Britain and worldwide and popularized her "Outline of Course of Instructions in Practical Psychology" ("Practical Psychology is Demonstrable Fact and Repeatable Phenomena"). Hallam taught the ability of the mind to modify daily reality and combined that hoary New Thought idea with a series of strangely modern sounding body exercises and postures, rhythmic breathing, cheerful environments, and "natural" food, etc., that helped in achieving the desired results. Oxford University; National Library of Israel.